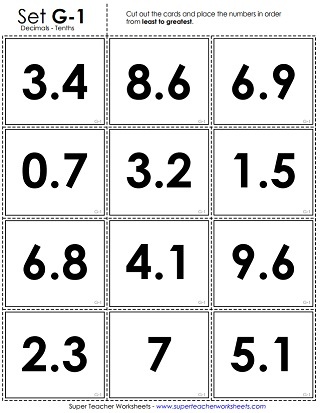 The place value PDFs on this page can be used for teaching students to write numbers in word name format, standard notation, and expanded form. Also review ordering numbers, comparing numbers, and more. These cards have decimal numbers (tenths) on them. Cut the cards and arrange them in order from least to greatest. Color each place in the number correctly, according to the instructions. Then cut out the place value strips and glue each one in the correct position above the number. This worksheet has whole numbers, decimals to the nearest tenth, and decimals to the nearest hundredth. Students determine their values and list them from least to greatest. Arrange the decimal number cards in order from smallest value to greatest value. 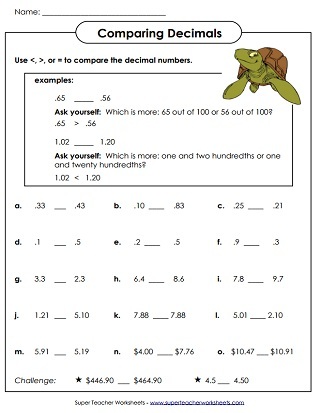 This worksheet has whole numbers, as well as decimals in tenths and hundredths. Tell which word name corresponds with the standard form decimal number. Write decimals in expanded form. Most decimals are in the thousandths. Write the value of the underlined digit in each decimal number. Students must correctly read aloud the decimal amounts. Includes numbers with both tenths and hundredths. Students read aloud the decimal numbers featuring tenths, hundredths, and thousandths. Teacher use the included score cards to mark progress. Read each decimal name and write it in standard form. Multiply each decimal by 10, 100, 1,000, or 10,000. Observe the patterns. Place the money amounts in order, from least to greatest. 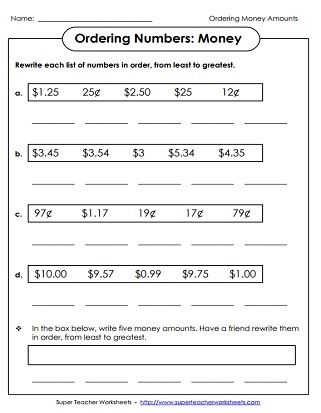 Teachers use the included score sheets as students are asked to correctly read aloud the shown money amounts. Students cut out the two halves of the Number Reading Wheel, attach them together and spin to read the displayed money value aloud. Learn about basic decimals with tenths, hundredths, and thousandths.